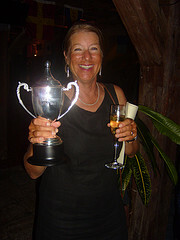 For all of our friends who may not have been watching the action online, 'Seabiscuit' has returned home from Antigua Sailing Week 2008 once again "bringing home the hardware". We raced with a crew of 10 women and we were helped immensely this year by our shore crew on our 'Fathership', C&C 38 'Pyjamas' captained by Martin and crewed by Eileen Worthley and my sister, Pam. Martin kept everything working splendidly on the boats, Eileen was our chef de cuisine, and did an exemplary job of keeping us all well fed and happy. Pam took care of details, ran errands and helped deliver PJ's to the various ports of call during the regatta. We sailed in division B this year, which consisted of 9 classes with a total of 108 boats. In our class of 16 boats we were the third smallest boat, the largest being a 71 footer and the smallest measuring in at 38'. With 13 boats larger than us and the usual windy conditions that Antigua serves up that big boats typically thrive on, I truly was not holding out much hope of a podium finish for the week. However, the wind gods were in our favor with breezes in the 12-18 kn range. We were on our game, had a great start and ended the first day with a first place finish! We were off to an auspicious start. Our finishes for the rest of the races were 4, 1, 5, 3 for a total of 14 points which tied us for second place at the end of the week. A nice addition this year was the awarding of daily flags to the top three finishers in each class so we were proud to fly two gold and one bronze flag from our backstay. At the awards ceremony, not only did we make it to the podium, we were in for more surprises. This year there were five boats racing with all women' crews. We were happy to learn that we won the trophy for best performance for an all female crew. 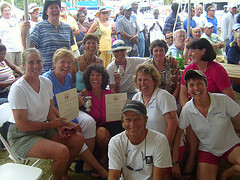 Just as we got back to our seats after receiving that award, the next one was announced - Best Caribbean Boat (Div. B). When the announcer sang out 'Seabiscuit' the crew went wild! This one took us completely by surprise. It is a prestigious award in the Caribbean and the first time we have won it either in Seabiscuit or Boomerang. Needless to say we were very proud. 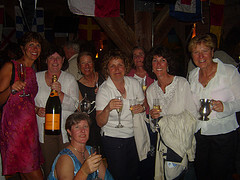 The champagne flowed that night! Much thanks to this dynamite crew!